WALDEMAR ~~~ RECOLLECTIONS OF TIMES PAST was begun after my wife was invited to become a member of the wildlife advisory panel of the Grand River Conservation Authority in the summer of 1996. Perhaps it was destined to be written in spite of everything for a host of other reasons. I guess that the main lesson is that no person can ever return to the places of his youthful recollections. What price "PROGRESS"! The cross-Canada aerial photographic surveys of the 1950's have been replaced by the sattelite surveys of the 1980's on. What changes will be spotted? Should anyone other than an inhabitant of Waldemar care what happens in this small village? 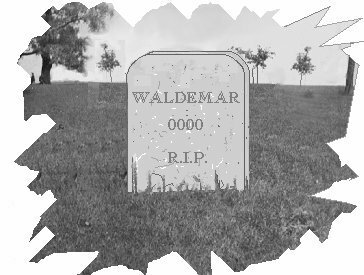 I may return another year to compare Waldemar with Grand Valley once again. What future observations and tales will our descendants make? 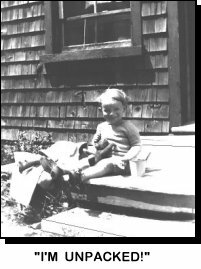 Katie Erickson of New Jersey, U.S.A., gave me a "dig in the ribs" about my memories at this back-roads cottage ... and "Why wasn't the tale written on my website?" To state that it was a "limited printing" is ducking the real issue. I am always telling others that I wished that some of my ancestors had written more anecdotal tales. I am always suggesting that others pass along their thoughts and observations for their own relatives to read. In short, I should take my own advice. So ... Here's to Katie! You were the first to be notified when this task was completed. Waldemar was predestined to remain a quiet, small country village for many decades after I spent my first summer there at the age of 15 months. It remained untouched by the order, regulation, technology and hustle of urban centres. 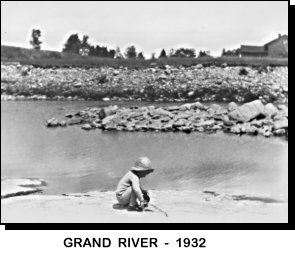 One gravel road, the "north road" ran from highway 9 keeping west of the Grand River which generally flooded its banks each spring; it would be duly noted, during the 1940's, that the Shand Dam, downstream, had been breached and must be repaired once more. This was "one of Nature's wee messages"! About one mile along the road, the old (pre-union) Presbyterian Church came into view. As I recall, this was at the southern boundary of the village proper. The "north road" passed under the railway bridge and continued northward past the turnoff to Grand Valley. Reverend John A. Ross was assigned to preach here half-way through World War I, and the family lived in the manse. The eldest surviving child, Fraser, was trained as a registered nurse at Johns Hopkins Hospital in Baltimore, Maryland, and she secured lengthy employment as a Public Health Nurse in Belleville. Phoebe had completed Grade 8 in Sarnia, and went to Orangeville for a Commercial Education. 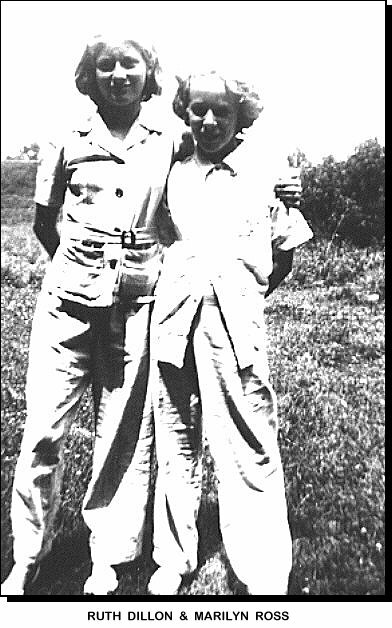 The youngest children, Marjorie and Jack, went a distance of five miles to Grand Valley for their elementary classes. As World War I came to an end, and the Reverend was assigned to Kilsyth, the family decided to keep a summer retreat on the property just over the river bridge on the north side of the "east road" that led to the railway station. The railway and the station seemed to form the northern and eastern boundaries respectively, insofar as cottages and homes were concerned in those days. As a small concession to the amenities of life, such dwellings would have a collection of coal-oil lamps, a well, a barrel for rainwater, a couple of wash basins (large, white mass-produced pottery), a couple of pots or "thunder mugs" for placing under the beds at night, a camp-stove for cooking, a pot-belly stove for warmth and baking or roasting, and a hand-cranked gramaphone or Victrola (record player). Bricks, warmed in the oven of the pot-belly stove, could be wrapped in newspaper and towels and tucked under the bedcovers on cold nights; they were the primitive precursors of hot-water bottles and electric blankets. The small community had no electricity. The manse would fare no better. The church was equipped with gas lamps which were raised half-way to the ceilings to hiss throughout the evening services; Phoebe somehow managed to learn how to operate the old foot-pumped organ. 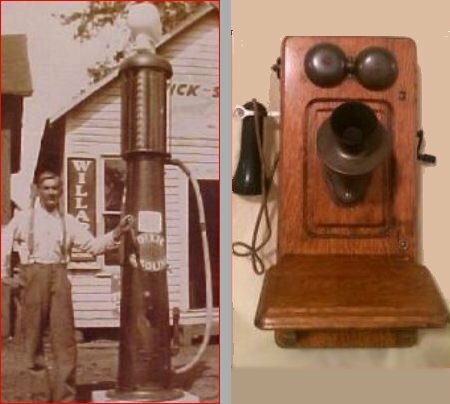 The general store was also the "post office", adding a hand-cranked telephone and hand-cranked gas pump in later years, and aside from the church and manse it was one of the first buildings to catch the eyes of a visitor arriving from the highway to the south. I can recall the long stick with a grapple on the end, which John Grosgurth could manipulate in order to reach boxes of cereal on the topmost shelves. Canned goods were stored on the lower shelves. Jars of candy and locorice-twists, quite naturally, tempted the customer(s) from the counter itself. 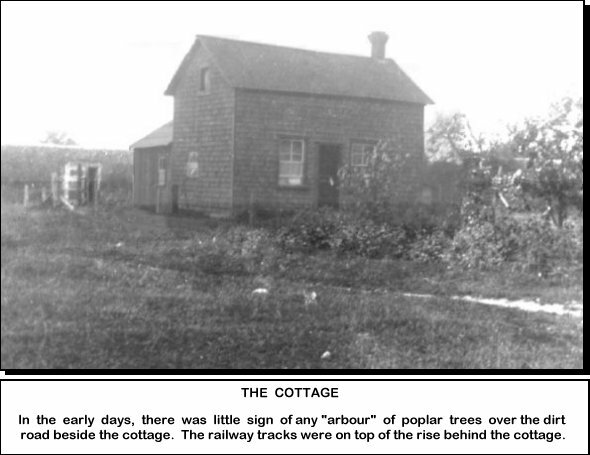 As mentioned, the shingled cottage of the Rosses, soon sheltered by a dense growth of bushes and poplar trees, was to the left or north side after one crossed the river bridge onto the gravel "east or station road". The bushes in front served to trap dust from the road when the occasional car drove by. Early on, someone had the forethought to plant maple trees just far enough apart so that hammocks could be hung between them, as an alternative to the cottage/Muskoka wooden lawn chairs. An arbour of poplar trees grew quickly over the dirt road at the side nearest the river; the leaves rustled pleasantly as one rested in a hammock much as the patter of raindrops from a summer rain lulls one to sleep. There was also the magic of lying back in the hammock at twilight or dusk to observe the silhouettes of bats as they flickered above the trees. It is my belief that these stands of bushes and trees served a loftier purpose by preserving the water table below and by keeping the well water so pure that it passed every safety test for decades. Nevertheless, the long-handled pump at the front gate required priming with a dipper of water each time you needed a pail or two of drinking water from the well. 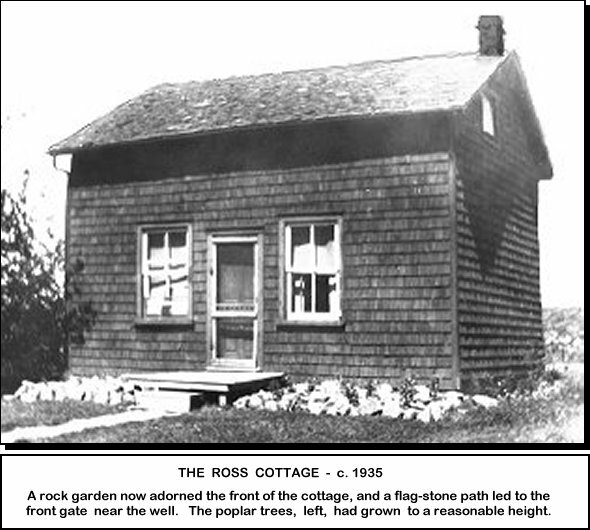 At the side gate behind the kitchen of the Ross cottage were a woodpile and a twin-seated "outhouse" with its bucket of ashes and department store catalogues. One memorable instance must have prompted the family of Reverend John to buy "thunder mugs" for indoor use at night. It seems that one of his first cousins, Maggie Fraser, became a frequent visitor after the Rosses moved to Kilsyth and she often went to the Waldemar cottage where she slept in the separate west bedroom in the attic. One night, Maggie had an urgent need to use the "outhouse", but she forgot that Aunt Phoebe and my Mother, Bea, had just given it a fresh coat of paint that afternoon. As a tribute to the education system on the Black Isle in Scotland, I must say that Maggie was quite literate. However, she did have a thick Scottish accent, trilling or rolling the "R's", as she read reprints of The Tale of Peter Rabbit to me from the Toronto Daily Star when I was a youngster. [Yes, that's the same Daily Star where the fictional Clark Kent, alias Superman, worked.] Back to this anecdode about Maggie Fraser, my grandmother McGregor had to chuckle when Maggie came to sections with "Misterrr MacGrrregorrr" in his "garrrden" or "Peterrr Rrrabit" in the "brrriarrr patch" from Beatrix Potter's tale (of 1893). Outside the side gate was a compost pile beside a dirt road; there was very little waste, and I believe that those simple early lessons about conservation served me well. The dirt road beside the cottage property paralleled the Grand River heading north under the railway tressles, across a trickling stream and through brush to a house belonging to the Gamble's, who also owned the farm to the south-east across the "station road". I learned how to make a willow whistle on this trail. One day, when I was much younger, I was walking along this road with my grandfather and I felt something crawling up my shirt; I was startled to discover a fat, brightly-coloured butterfly larva on my shoulder. Seeing the alarmed look on my face, he flicked the intruder off with the tip of his cane. I prefered to observe such creatures of nature at a "safe" distance until I knew them a bit better. 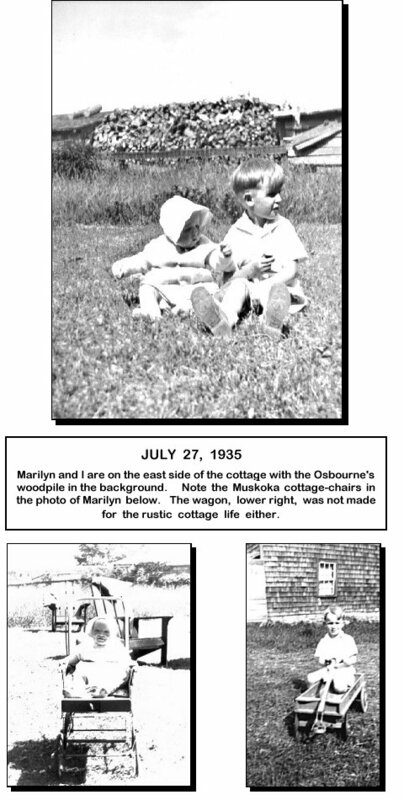 Sometime around 1948 or 1949, I remember arriving at the cottage to learn that, a few days earlier, stones had been tossed at the windows of the vacant Gamble house at the end of the road. What a way to amuse oneself on a Summer's day! That infraction was remedied in short order; justice was dealt out swiftly and wrongs were corrected just as quickly. Accountability was an important ideal, then as now, but should public ridicule be the solution? I recall one summer when my sister, Marilyn, had barely entered her teens. There, up on the railway tracks behind the cottage, she was evidently curious about something that was occurring down below on the other side. I called for her to come down, but she steadfastly held her ground. (The neighbour to the east had some connection with the C.P.R., and had warned my cousin and me about climbing around the railway tressles and down onto the support pillars of the bridge across the river.) When I reached the top of the hill, I discovered what the attraction was. Close to twenty local farm lads were scurrying thither and yon in search of their clothes, but many had submerged themselves in the old swimming hole until the uninvited apparition atop the tracks disappeared. 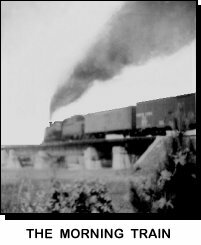 An exceedingly slow train travelled west from Orangeville every morning except Sundays, and did a repeat performance coming east from Grand Valley in the late afternoon, billowing black smoke from the chimney of its steam engine. Then there were the "jiggers", pumped up and down in teeter-totter fashion by two section men, who regularly inspected the tracks. Motorized "putt-putts" were reserved for longer inspections. Morning mail (and sundry items such as jelly beans and licorice twists) induced one's dusty trek southward down the gravel road to John Grosgurth's general store, often before the mail had been sorted into the wooden post-boxes. Sundays heralded a slightly longer journey to church along the same dusty route. Three hymns were listed to the left front of the pulpit, but I generally fell asleep during an evening service to the hiss of the gas lamps ... some time between the first hymn and the sermon. The front door of the cottage opened into a livingroom with its Franklin stove and kindling box. To the left was a bedroom. Straight ahead, another door with clothes-hooks on the livingroom side, led into the kitchen addition. At the far right corner, a door led to an almost vertical stairway to the attic. From the tales of my cousins, I have learned that the families from Minto were among the early visitors ... and that gatherings at the Waldemar site may have been the precursor to the Annual Ross Family Reunions. There was a ritual to the opening of the cottage for the season; after the front door was unlocked, a crowbar was used to pry loose a block which held a two-by-four, braced against the kitchen door. A similar deterent to thieves barred the door from the kitchen to a side porch. Thieves were unknown in the area. 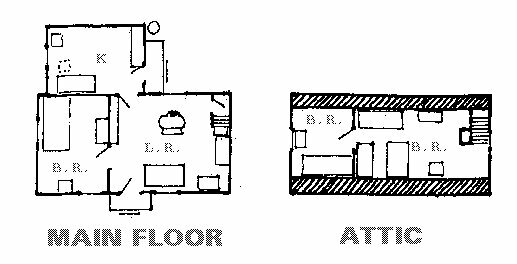 To the far right corner of the living room was a door to a steep narrow stairway which led to an attic with windows at each end --- in a large communal bedroom (which could be partitioned by sheets strung on wires) and in the smaller room on the west side. I recall that a big canvas tent, purchased around 1910, was stored in the attic, but it was only erected once beside the cottage after the tall grass had been cut with a scythe. The lowly apron was an item to be remembered with fondness. It served many purposes beyond the obvious one of protecting the dress beneath. It was used as a potholder in an emergency. It was great for wiping away the sweat from one's brow in a hot kitchen, or for scrubbing the face of a wee urchin with dirty cheeks. It held the pods when the peas were shucked. It was used to collect wild strawberries from the fields and to bring in the fallen apples from an orchard. In a pinch, it could be used for a quick dusting of the furniture when guests appeared. Nothing will likely replace the "old-time apron". The rain barrel was outside at the north-east corner of the kitchen, and a pitcher and washbasin were on a stand outside a small livingroom window (or outside the kitchen window during most years). Phoebe labelled some springclip clothespegs with names of family members so that individual washcloths and towels could be strung on a line above the wash stand. When you used the dipper to fill the basin with water from the rain barrel at the end of the uncovered porch, it was not uncommon to include a couple of mosquito larvae. 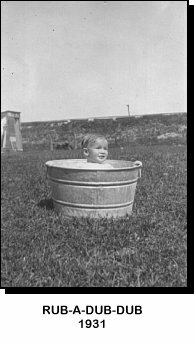 Without electricity, there were no washing machines and driers --- just a tub and scrubbing board and the sun; rain water from the barrel was softer than the well water for washing clothes. Speaking of rain, whenever there was a thunderstorm, those whose lot it was to sleep in the attic made a mad dash to collect pots, pans, dippers, pails and even the tub. Yes, before it was repaired, the roof was known to leak! I cannot say that the "PING-PING-PING" of the drops ever kept me awake. Fresh country air, combined with a summer shower, always induces me to sleep. Guests at the cottage were legion. 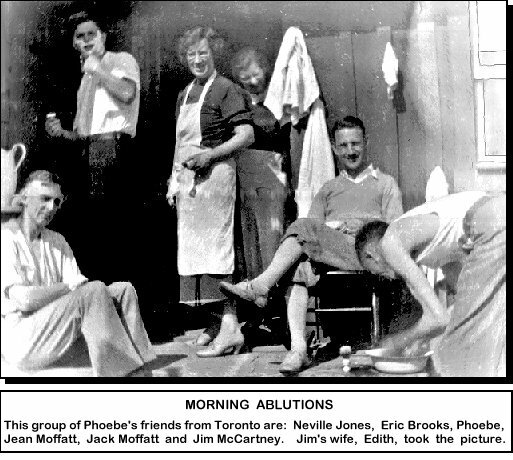 Phoebe had her Toronto friends up for brief holidays. 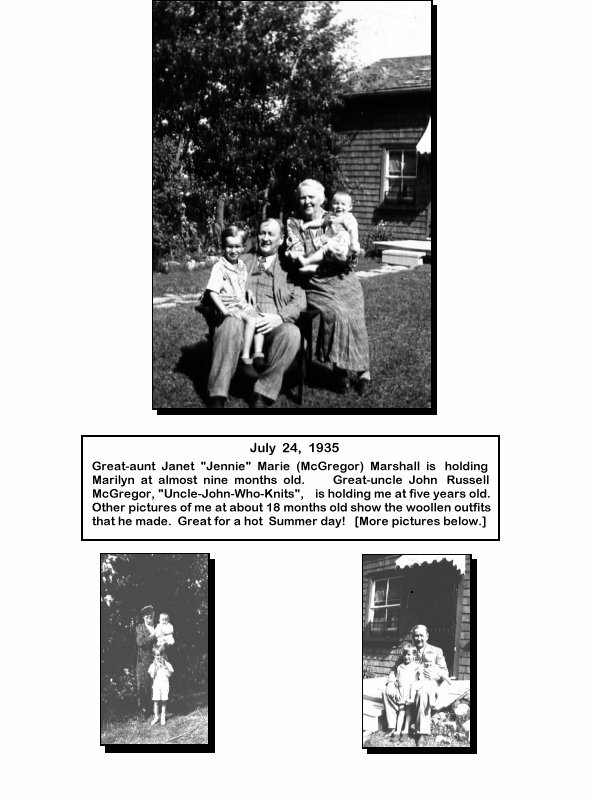 My grandmother had some of her McGregor siblings stay over when they could. Many of the Reverend's nieces and nephews from nearby Minto Township in Wellinton County arrived for holidays and get-togethers at the cottage before his retirement in 1929. Thereafter, he moved to Toronto with his wife and two younger daughters. The trip by car was a gravity-defying experience when they reached the "Caledon mountains"; everyone got out of the car as it was turned around to back up to the top of the steepest hills in reverse gear. Although I was born one year after my grandfather's retirement, I can remember a number of those occasions. I also experienced the rough ride over patches of "corduroy road" that were still around, their gravel surfaces supported by the tree trunks laid across swampy ground. There were also memories of the inhabitants of Waldemar: Gamble, Burke, Osbourne, Grosgurth, Dillon, Lomas, Brown, and so on. 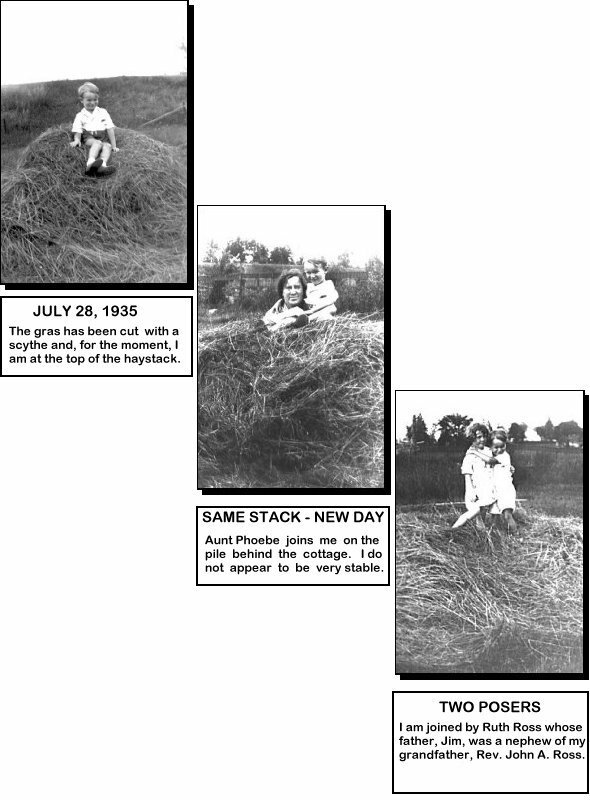 There was a local, rural speech inflection at the end of a sentence a rise and lowering on the final two syllables which was particularly noticeable in the speech pattern of younger residents. 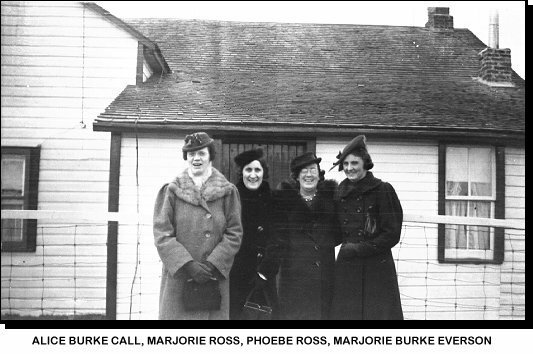 Several "old-timers" may still recall the grand opening of Garfield Tolton's Park across the road from the Ross's cottage and beside their Osbourne neighbour's property which housed a chicken coup. Mr. Tolton drove up in his Model "A", one of the first "horseless carriages" seen in the area. It was a day for frozen ice-cream strawberries, sandwiches, tarts and lemonade. Some of the cedar trees had been cleared to create a picnic area. Planks had been brought in to build picnic tables and benches. There were even a couple of barrels for garbage, but no-one had the foresight to plan for them to be emptied. Lest I be accused of painting a picture of an idyllic paradise, I should acknowledge that several years later I checked inside one of the barrels and was stung by a bee for my troubles. No, I haven't forgotten the cut on my right foot from a broken bottle while I was swimming beneath the main bridge across the river. Nor will I forget much of one summer spent with a case of measles in a darkened bedroom off the livingroom. Marilyn recalls another event with mixed feelings. She was in the west bedroom of the attic when a wasp decided to declare its territorial rights by stinging her near the right eye. Although the area around the eye was treated with some hydrogen peroxide and the usual baking soda remedy, it continued to swell. Mom took her to Orangeville where an inebriated doctor declared that the previous treatment was sufficient and the swelling would go down. As they left, the doctor followed and made several lecherous remarks. The poisonous infection around the eye proved to be a problem for several weeks, and received proper treatment from the family doctor in Oshawa. The large field beyond the park provided sufficient harvest during strawberry season to provide several jars of jam. The tops were sealed with wax melted in a double boiler. A grand-daughter of John Grosgurth advises me that chemical spraying of the surrounding fields has obliterated the vast patches of wild strawberries which were once to be found during the years of her youth on the slopes beside the tracks east of the C.P.R. station. 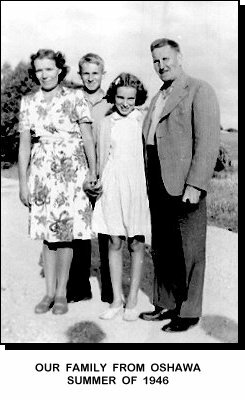 Upon my grandfather's death on July 26, 1942, the family continued to holiday at Waldemar, except for a couple of years during World War II due to gasoline (and other) rationing. 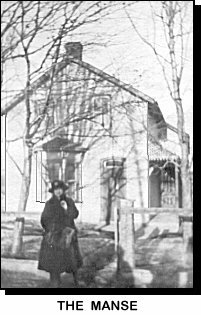 Both the family home and the cottage were purchased from the estate by Fraser, the eldest daughter, after the death of the Reverend's wife, my grandmother, on March 19, 1948. The family would continue to visit Waldemar for only a couple of more years. The old railroad bridge and the tracks managed to vanish a few years later, but not before I investigated one of my favourite haunts on the other side . . . the old swimming hole. What a mess! I wouldn't want to drink water from any well within a mile! What garbage of humanity would toss an automobile, used tires, broken bottles, discarded furniture and other refuse into an unsightly pile. A less-than-inviting stream still trickled on its way to join a "Less-Than-Grand River". Alas, here I once saw myriads of Queen Anne's Lace and my first Jack-in-the-Pulpit growing wild. We quickly returned to the "river road" and drove north beyond the tracks to the next bridge over the river. What used to be a swamp with plenty of birds and other wildlife, had been completely overgrown with purple loose-strife, which was introduced to Canada from Europe by some individual of questionable mentality. Two million very small seeds can spread from that one patch each year. Fortunately, scientists have discovered a European beetle that attacks only the purple loose-strife, and the problem could be solved approximately ten years after the beetle is introduced. Otherwise the unarrested eye-sore will spread! Ah well, out of sight equals out of mind! I was not surprised when, a few years later (after a dozen copies of this tale were distributed to some of the older residents), I noticed that the Gamble Road beside the site of the old Ross cottage had been sealed off at the old railway trestle after the tracks had been removed. Now the garbage dump is out of sight and out of mind as well! Many current Waldemar folk have spoken to their councillors about this in addition to the expansion of the former property of Reverend John A. Ross across that access road to the once-upon-a-time Grand River. Alas, apparently, this has been to no avail. If this is true, [i.e. the obliteration of Gamble Road, the blockage of access by today's youngsters to the "swimming hole", and the denial of the public right to walk along the east side of the river] I say, "SHAME! SHAME! SHAME! on the council." Therein lies the reason why so many persons distrust politicians. I am certain that Reverend John A. Ross would have been be quite disgusted, if council made no attempt to obtain a consensus on the issue from the members of the Waldemar community. The words, "sealed off" and "garbage dump", are metaphors for the negative side of recent developments in Waldemar. I would hope that corrective forces have been implemented in some instances. One might also note that Grand Valley is also plagued with the purple loose-strife weed. The problem expands relentlessly. The "old swimming hole", although cut off from any easy access, may yet survive past ordeals and threats. 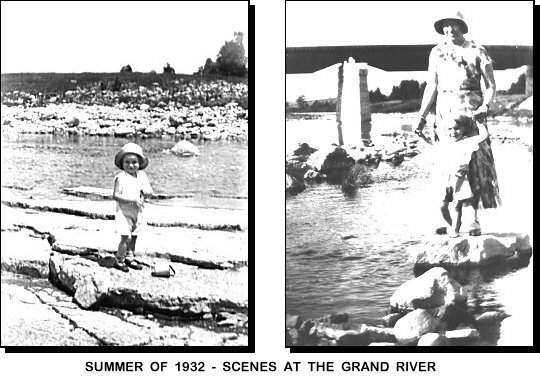 Kids will return to fish there, and some may even try to deepen the pool by restoring the dam. if you wlll kindly follow. Of Great St. Peter's dome. That hums and buzzes daily. Owned by Simpson and by Eaton. Well so have we; yes we have two. So there; we can't be beaten. Where come the little Fords. They're coming here in hordes. But he goes on forever. Where waters roll in torrents. The C.P.R. our country crosses. It stretches o'er the nation. What place excels our little town? We also have a station. There stands a little college. Now I have told my little tale. Just go out and look around. This poem was written by Mrs. 0. 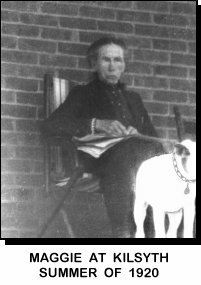 Hargrave, teacher of our little college in 1924. Marjorie Burke recited this at the Xmas concert, when she was age 10.
and I was so impressed by it. I have so many fond memories of the Ross Family. myself that I found. It was taken at our place after I was married. from Waldemar were dedicated at our Church in Orangeville. I had to write and let you know I always cherished Waldemar Church. The following is an email received on May 7, 2012, from a couple who had moved into the building on the property of the old cottage . . . I was handed your writings on Waldemar from a resident of Waldemar who told me that they had a rich insight into the house my fiancee and I had moved into a few short months ago in September of 2011, Ross's cottage. What a delight it was to read of the 2 maple trees at the front of our yard that were planted just far enough apart to hang a hammock and the tale of the farm boys skinny dipping in the swimming hole, ( a place that we often walk to and simply call, "the brook"). As I sat reading your wiritngs aloud over dinner in our kitchen, I was shocked how your writings were affecting me. Both Bill and I could easily picture the areas of the house and the landscape as you were writing. Goosebumps covered my arms as I was taken back to an earlier, simplier time and read events that happened in the very room I was standing in, the room I slept in and the trees I run under to get out of the rain. Thank you for sharing your memories and the history of what we call home. 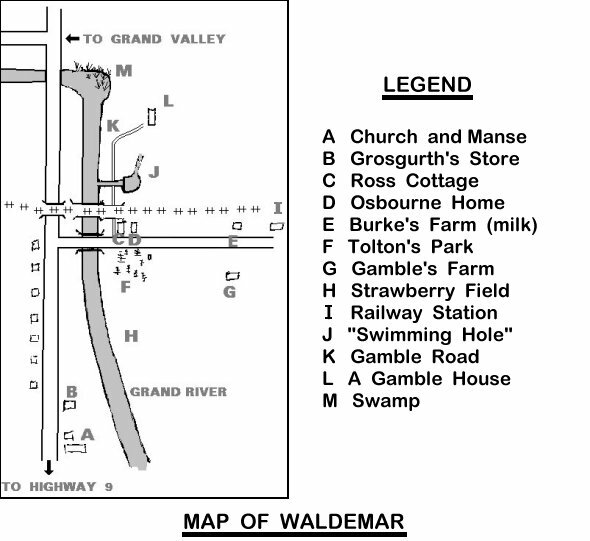 If you ever find yourself in Waldemar, feel free to stop in!